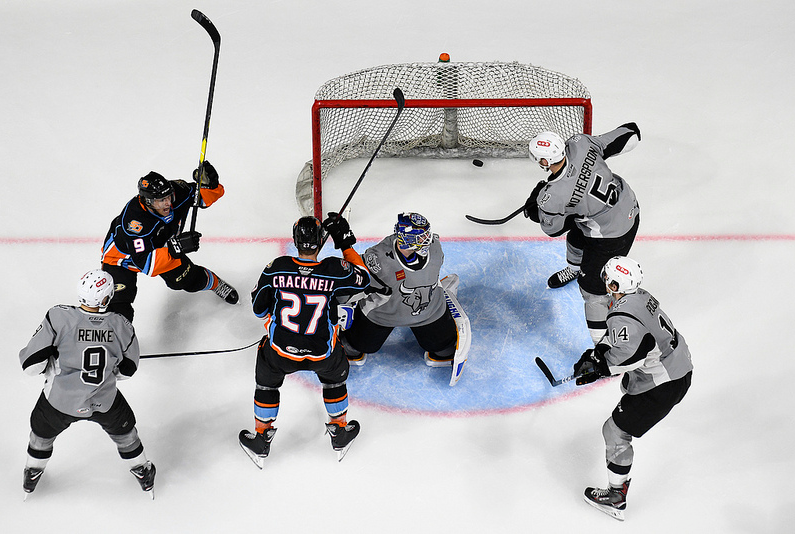 Adam Cracknell scored on a rebound midway through the third period for the go-ahead goal as the San Diego Gulls overcame two deficits to defeat the San Antonio Rampage, 5-4, Saturday evening. Cracknell put in a rebound of a shot by Kevin Roy with nine minutes, 15 seconds to play for his eighth goal in his last 10 games and ninth in 17 games with the Gulls since being acquired by their NHL parent team, the Anaheim Ducks, Dec. 10, from the Toronto Maple Leafs in exchange for defenseman Steven Oleksy. The Gulls increased their lead to 5-3 on Justin Kloos’ empty-net goal with 1:20 remaining before a sellout crowd on Country Night announced at 12,920. San Antonio pulled within one with 19 seconds left on Chris Thorburn’s second goal in his 24 games with the team, but were unable to re-tie the score, falling to 1-6-1-0 at Pechanga Arena San Diego. The Gulls tied the score, 3-3, with 13:23 remaining on Sam Carrick’s 27th goal of the season, extending his team record. Carrick is tied for second in the American Hockey League in goal- scoring, one behind Chicago Wolves left wing Daniel Carr. Center Joel L’Esperance scored 27 for the Texas Stars before being recalled by their NHL parent team, the Dallas Stars, Feb. 15. San Antonio (25-24-5-0) took a 3-2 lead when Bobby MacIntyre scored off a turnover 1:03 into the third period. The Gulls remained within one thanks to goaltender Jeff Glass’ sprawling save on a shot by defenseman Tyler Wotherspoon with 16:43 to play. Glass made 18 saves as his record improved to 10-7-0-2 and 7-3-0-1 with the Gulls since being acquired Dec. 10 from the AHL’s Toronto Marlies in exchange for future considerations. Following a scoreless first period, the Rampage opened the scoring 7:57 into the second period on Ryan Olsen’s power-play goal. San Antonio took a 2-0 lead on a power-play goal by Jordan Nolan at 9:57 of the second period, 21 seconds after Gulls defenseman Trevor Murphy was called for high-sticking. The Gulls got goals from Roy and Simon Benoit 15 seconds apart to tie the score, 2-2, with 3:58 left in the second period. Roy’s goal was his first in four games since being loaned to the Gulls by the Ducks Feb. 15. The goal by Benoit, a rookie defenseman, was his second in 49 games with the Gulls this season. The other was on Nov. 25. The Gulls led in shots, 24-22. Goaltender Jared Coreau made 19 saves for the Rampage, which is tied for sixth in the seven-team Central Division with the Manitoba Moose (25-25-3- 2), the Winnipeg Jets AHL affiliate. Coreau was 3-6-1-2 with the Gulls before being traded by the Ducks to the St. Louis Blues, San Antonio’s NHL parent team, Jan. 3, in exchange for future considerations. The victory moved the Gulls back into a tie for second in the Pacific Division with the idle San Jose Barracuda (29-13-2-4), the San Jose Sharks AHL affiliate. Both teams have 64 points. The Bakersfield Condors (32-15-2-1) lead the division with 67 points. The Edmonton Oilers AHL affiliate extended its winning streak to 16 games Saturday with a 2-0 victory over the Tucson Roadrunners. The sellout increased the Gulls league-leading attendance average to 8,904 per game. Eakins called the atmosphere electric. “It’s so loud down on the bench,” Eakins said. “We go into a lot of buildings, if we get up 2-0 on the other team, their fans start lighting up their players, they’re booing them. The Ducks announced earlier Saturday they had recalled rookie professional Sam Steel from the Gulls and assigned left wing Brian Gibbons to them. The 21-year-old Steel, a center who was chosen by the Ducks in the first round of the 2016 NHL draft, was fifth on the Gulls in scoring with 32 points on 15 goals and 17 assists. The 30-year-old Gibbons had two goals and three assists in 44 games with the Gulls this season. He had 19 goals and 34 assists in 169 NHL games with Anaheim, New Jersey, Columbus and Pittsburgh. Gibbons was not in uniform Saturday. The Gulls will next play Friday at Stockton, the Calgary Flames AHL affiliate.